Heavy Equipment Servicing NCII Program for June 2017! 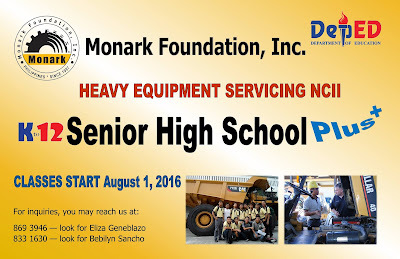 July 25-July 30, 2016 is the last week that we will be accepting applicants for our Senior High School Plus Heavy Equipment Servicing NCII Program! We are now accepting applicants for June 2016! With good moral character and highly interested in developing a career in the heavy equipment industry. With good moral character and highly interested in becoming a highly competent and job-ready employee. *Please arrive before indicated time. Daily - Please contact CDO School Head. Monark Foundation now offers training programs that build professionalism in the work place. From leadership, to communications and work attitude, we customize our programs to equip your team to produce extraordinary results. 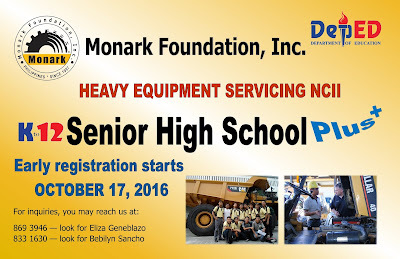 The Monark Foundation, Inc. is offering 75 scholarship slots to all Filipino youths to take Heavy Equipment Servicing NC II. The Institute adopts the Dual Training System of education where scholars acquire sufficient and quality technical knowledge in school and practical competencies in the industry.As accredited by the Technical Education and Skills Development Authority (TESDA) and sublicensee of CATERPILLAR Institute of Australia, our graduates are highly recognized both locally and abroad. For more information, please contact the Registrar at 0932-8602845 (San Pedro) or 0917-3280231 (CDO). For Assessment schedule and inquiries, please contact Ms. Cathy at (02) 869 - 3946 and/or 0932-8602845. 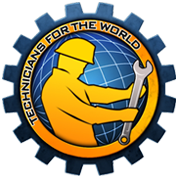 From the first batch of 63 graduates from the Technicians for the World project, seven (7) will be deployed to a French CAT Dealer with operations in Equatorial Guinea, Africa. Thirty seven (37) of them will be deployed in a major Middle East CAT dealer, while the rest will be absorbed by Monark Equipment, the Philippine dealer. These graduates have passed the Caterpillar skills assessment as well as the TESDA NC2 Assessment for Heavy Equipment Technicians. Monark Foundation Institute held two separate Commencement Exercises this month for the graduates of the Technicians for the World program and its other offerings. For the MFI San Pedro branch, the event was held last February 7, 2011 at the Philippine Stock Exchange Auditorium in Pasig City. A total of forty (40) graduates were honoured that day. Atty. Teodoro C.Pascua, Deputy Director General for Field Operations of TESDA was the commencement speaker, while Mr. Amador P. Buenaseda III was the Keynote speaker. TESDA Misamis Oriental gave the Commencement message and Mr. Jay Jaranilla of CAT Asia-Pacific was the Keynote speaker. Ms. Ana Banson Pastelero, Treasurer of MFI represented the Board of Trustees in the event. The two branches of Monark Foundation both celebrated the 13th Foundation Day last October 23, 2010 plus a week-long observance of the momentum occassion. Both started the week with a Holy Mass attended by scholars, faculty and staff. Sports events, talent competitions and fun games for scholars were held in Cagayan de Oro and San Pedro that same week. The celebration was capped by the Foundation Night, a dance party held at the Quezon City grounds. The 63 graduates of the Technicians for the World Project all completed their National Certification 2 assessments facilitated by the Technical Education and Skills Development Authority (TESDA). 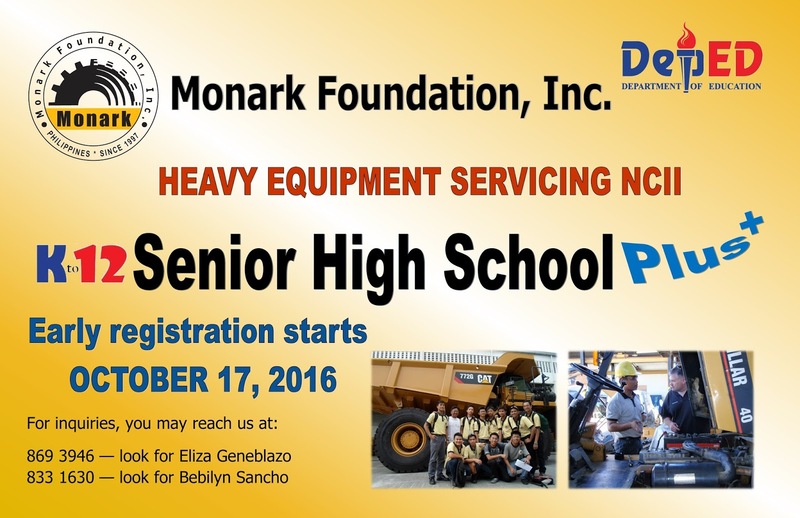 As NC 2 holders, graduates are recognized to have skills fit for a Heavy Equipment servicing mechanic under the Philippine Qualifications. The graduates completed their 2-year Heavy Equipment Servicing Course in MFI, July 2010. 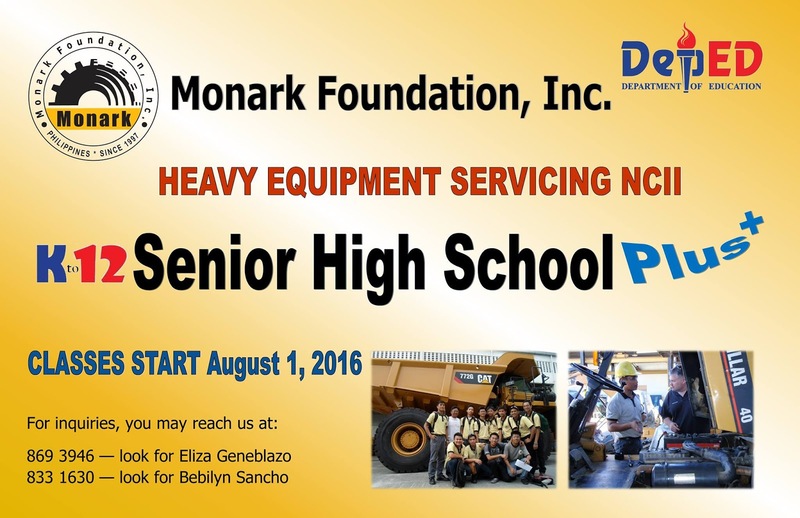 Monark Foundation is extending the coverage of the Technicians for the World project to HEST Graduates. Skills upgrading training will be provided to qualified applicants who are willing to be part of the project. For details, please call 869-3946 and look for Ms. Cathy Horaguchi. Don't miss this opportunity! A competency assessment was facilitated by CAT Asia-Pacific Service Learning Senior Training Consultant Andy Reid last March 4 and 5, 2010 in San Pedro Laguna and Cebu City, respectively. Mr. Reid tested the knowledge level of the scholars thru a paper and pen test, then evaluated their skills level thru different practical troubleshooting activities. The participants in the said assessment are scholars who belong to the first batch of the Technicians for the World project of CAT and MFI. These scholars will be graduating in July this year.